Four good wines, but they weren’t exciting. 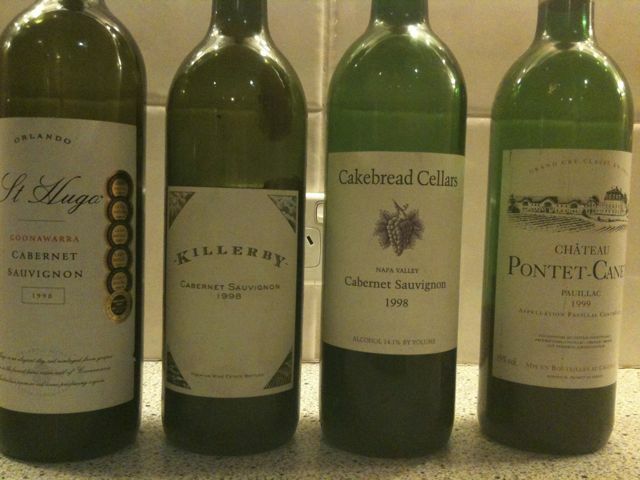 I had hoped for more enjoyment from 12 year old wines, perhaps I my tongue just was in an odd mood. A very cabernet blackberry style. Maybe we should have started with a younger wine because this doesn’t seem to be showing any age to me. I like how it doesn’t reek of minty eucalpyt, but it is fairly straight-forward. I wonder, indeed I doubt, if these wines really gain complexity with age – they seem to merely soften. This is very different. Definite age here. Mellow with noticeable alcohol, cuddly wine. Not a syrupy blockbuster, more natural less extracted and concentrated than any Californian cabernet I have had in recent years. Dark. Some flavours of grape skins. Disjointed, starting to fall apart ? Not showing any of the dilution (rain) that hit Bordeaux. Solid but austere style. Lacks the flavour, style (and fun) of Leoville Barton 1999. This entry was posted in Australia, Bordeaux, Cabernet Sauvignon, France, USA, Wine by ByronSharp. Bookmark the permalink.